​SAN DIEGO – Fifty-nine formerly homeless seniors have a permanent place to live thanks to a new housing community in San Diego’s historic Talmadge neighborhood. It’s called Talmadge Gateway, and it’s a prime example of a model called ‘Housing First’ that has proven effective at reducing homelessness in cities across the U.S.
On July 27, nonprofit affordable housing developer Wakeland Housing and Development Corporation held a grand opening ceremony for Talmadge Gateway, which is the first 100 percent permanent supportive housing community in San Diego for seniors who have been homeless and have ongoing medical needs. Wakeland developed the 60-unit property (with 59 rentals and 1 managers’ unit) in partnership with City Heights Community Development Corporation and services will be provided primarily by St. Paul’s Senior Services’ Program of All-inclusive Care for the Elderly (PACE) – a unique program that offers a wide variety of healthcare and social services for seniors. “St. Paul’s has made a commitment to address the overwhelming growth of homeless seniors in San Diego,” said Cheryl Wilson, CEO, St. Paul’s Senior Services. “We’ve provided permanent housing to almost 100 seniors who were previously homeless or at risk of homelessness. Of those, 96% continue to live successfully in their new homes and in fact, thrive. We attribute our success to the comprehensive medical and social support provided by the St. Paul’s PACE program. For most of those who live on the streets, their social and health challenges need to be addressed before introducing them into permanent housing, and of course that support must continue once they have moved into their new home. Talmadge Gateway has given us the opportunity to take another 59 seniors off the street. We’re very proud to be a part of this effort,” added Wilson. Talmadge Gateway gathered support from local community members early in the development process, with neighbors embracing the project’s goal of revitalizing a site that had previously been an auto storage lot with a vibrant new community of affordable homes that serve seniors. “Community outreach from the very onset shows how a development such as Talmadge Gateway can fit into an older urban area and can complement the surrounding neighborhood,” said Fred Lindahl, a neighbor who serves as Board Chair of City Heights Community Development Corporation and formerly led the Kensington Talmadge Planning Group. Designed by Studio E Architects and built by Allgire General Contractors, Talmadge Gateway features three stories of beautiful and functional homes above a ground floor with parking, community rooms for on-site services and a multipurpose “supportive care office.” A second-floor terrace offers additional space for socializing, and special architectural details – like wide stairwells with porthole windows and cheerful paint colors – encourage active living. 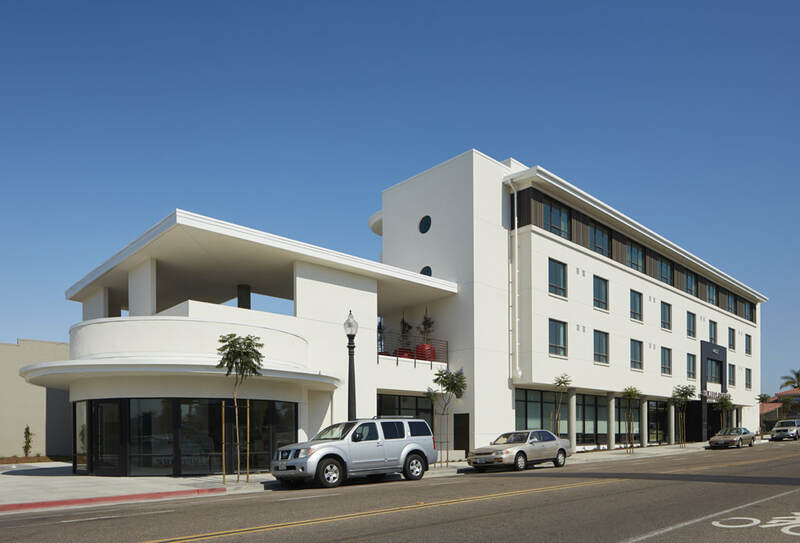 A unique feature of Talmadge Gateway is that the development also includes a new, 500-square foot storefront for commercial use and a 1940’s-era commercial building along El Cajon Boulevard that was renovated during construction. The $20.7 million development was completed on time and on budget. Financing come from a number of sources, including debt and tax credit equity from Wells Fargo Bank, a loan and Project-Based Section 8 vouchers from the San Diego Housing Commission, and funds from the California Community Reinvestment Corporation and the Federal Home Loan Bank of San Francisco.